Today, two weeks after I lost my glasses, I broke my spare pair of glasses. I’m not having a great week so far. On Monday I lost my car keys. I should’ve told that story on Monday but never mind, I’ll tell it now. I finished work and walked to my car, as I was entering the lift to take me to the level of the car park on which my car was parked I started to look for my keys in my bag. They weren’t there. They weren’t in my pockets. I guessed I’d left them on my desk. I had to wait for the lift to go all the way up to level three, before I pressed the ‘G’ and descended back to the ground floor. They weren’t at my office either. I searched my desk, my drawers, the kitchen. Nothing. At that point I was not panicking, mainly because I didn’t believe what was happening. “They’ll turn up” I told myself. I asked at reception and we phones lost and found for the shopping centre but neither of them had had anything handed in. More annoyed than panicked, I realised that I didn’t actually get as far as checking to see if I’d left them in my car. On the way back to the car park I went in to a few pubs to ask if they’d had anything handed in. I thought that if they’d fallen out somewhere then someone might’ve handed them in to the nearest establishment. The pubs didn’t have anything, but my logic was correct. I walked into the Subway-come-Convenience store, and when I asked the man behind the till if he’d had any keys handed in he said the two words I’d been longing to hear. “YES. THOSE ARE THE ONES OH MY GOD I LOVE YOU” I overreacted, but it was a very good moment. I was relieved. I’d began to let myself think about the consequences. Without a key I’d have to have the doors taken off to remove the lock and fit a new one. My car was at the top of a multi storey car park. It couldn’t get towed down, so I’d have to get the mechanic up to car park. It would be disastrous. “I need to take cash to open the till” he told me. “I’ll buy a scratch card,” I said. I was feeling lucky. I emptied the contents of my wallet and found exactly 95p. A five pence piece short of a scratch card. Without a cash purchase he couldn’t open the till. So we stood and waited until a customer paid with cash. I’d never been so happy to see that Mickey Mouse keychain I bought at Disneyland. Looking back on it, there was probably something in the shop I could’ve bought with 95p. But I wanted the scratch card. I rummaged around in my bag and found a five pence piece. And, as it was my lucky day, I won £2 on the scratch card I bought to reclaim my keys. Doubled my investment and reclaimed my keys in the same instant. A great moment. Thanks to whom ever handed in my keys. To you they are useless unless you try them in every Peugeot in Gloucester, but to me they’re a golden nugget. Today, however, I’m armless on my one pair of operational glasses. And I kind of need them for, like, seeing things. I have prescription sun glasses, but they become more of a hindrance than a help when the sun goes down. 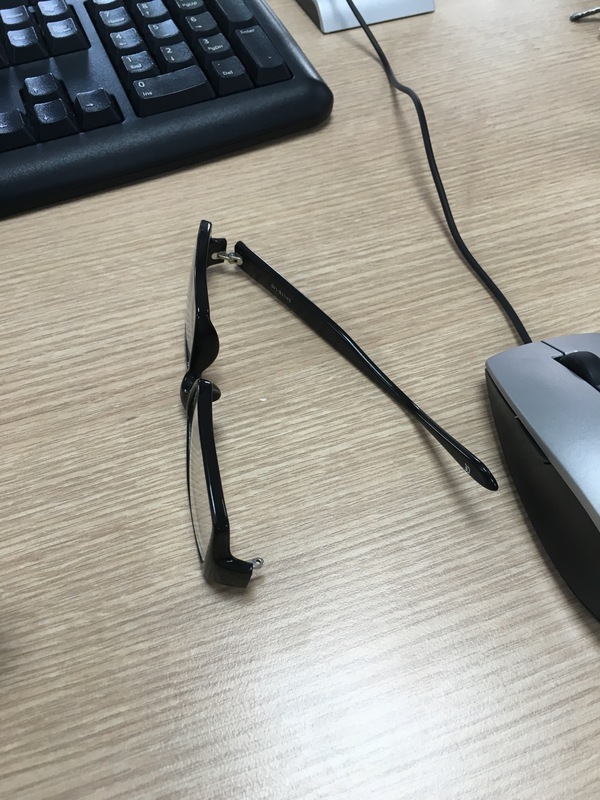 I’ve yet to arrange an appointment with Specsavers to solve my glasses problem, I would say that I keep forgetting, but it’s hard to forget when I’m reminded every time I put on my (now limbless) glasses. They’re an old prescription, you see. And they hurt my eyes a bit. I dryly tagged Specsavers (other opticians are available) in a passive tweet about my situation earlier, but they just took my “see you soon @specsavers” as a “see you soon” and didn’t take my implied offer of wonderful free publicity. Should they have said “the next pair are on us!” then I’d’ve been super happy and they’d’ve got some good PR so really everyone would win. Until tomorrow, and I’d be able to see again. I hope you have better luck soon!